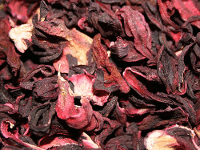 Zobo (Zoborodo) is a Nigerian beverage made from dried Roselle plant flowers. The drink is also known as Roselle drink and called Sorrel drink in the Carribean. Zobo has a sour taste so it can clash with sugars. This why I prefer to keep my Zobo drink as natural as possible hence I use only natural ingredients when preparing the drink. You may add artificial flavours and sweeteners such as Nutri-C and sugar if you wish. The following are what I used to make 5 litres of Zobo drink. You can get more with the same quantity of ingredients depending on the concentration you want. If you will be using artificial flavours, you need to add more water. Feel free to add any sliced citrus fruits of your choice: orange, lemon, lime. 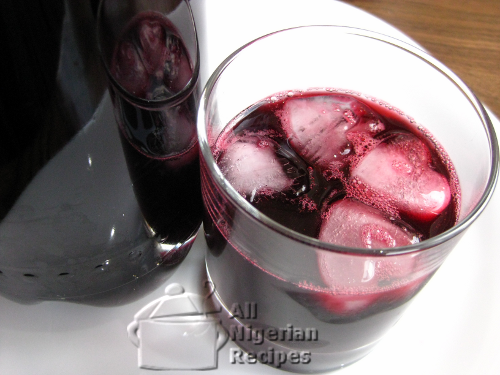 Wash the dry Zobo leaves repeatedly in cold water. Zobo leaves are usually very dusty so make sure you wash off all the dust. It will seem like all the flavours/colour of the zobo are being washed off but don't worry, you will see that the dry zobo leaves still have a lot of the colour intact when you start boiling it. Peel and cut the ginger and garlic into tiny pieces. Put the washed zobo leaves into a deep pot. Add the pineapples and pour enough water to cover the contents of the pot and then some. Start cooking at medium to high heat and let it boil for 5 minutes. Add the ginger and the garlic, add more water and keep boiling for at least 30 minutes. This is the time it will take for the zobo leaves to be completely soft and the pineapples tender. Turn off the heat and set aside to cool down completely. When cool, wringe out the juice from the pineapples and zobo leaves, leaving only the zobo juice in the pot. Pour the juice through a sieve to take out the remaining large particles then pour it through a chiffon cloth to remove the tiniest particles. Add any artificial flavours of your choice at this time and stir. Pour into bottles and refrigerate. Serve with ice and sliced fruits. Enjoy it on a hot sunny day with any Nigerian snack.